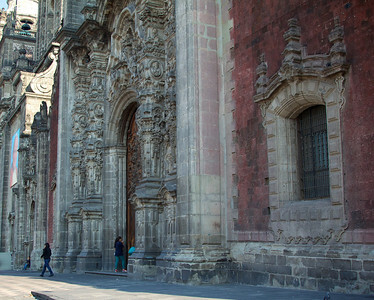 Catedral Metropolitana de la Asuncion de Maria Oldest and largest cathedral in the Americas. 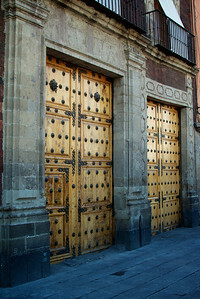 Construction started in 1573. 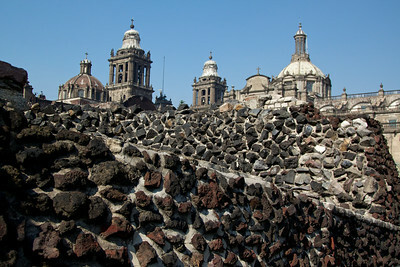 Catedral Metropolitana as seen from Templo Mayor. 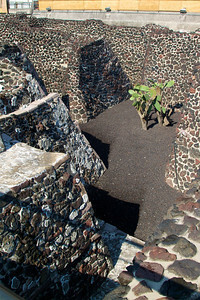 View out from entrance to Templo Mayor. 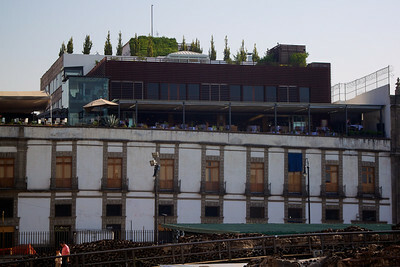 Building overlooking Templo Mayor with rooftop restaurant. 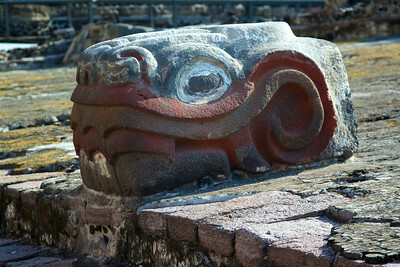 Serpent head, can see original coloring. 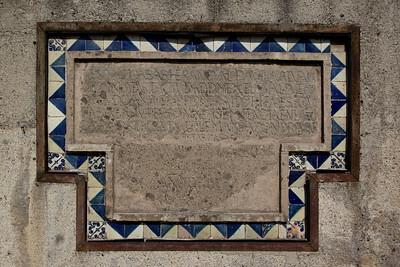 Plaque commemorating Avila brothers who had built their residences at the Templo Mayor site and destroyed much of the great temlple. They were beaheaded for conspiring against the crown in 1566. This plaque was carved in the 16th century after their death. 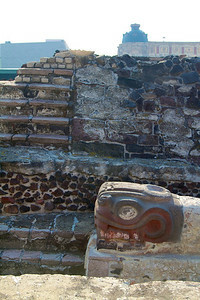 Serpent head with remains of original coloring. 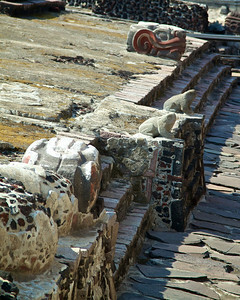 Two frogs of the frog altar, associated with the rain god. 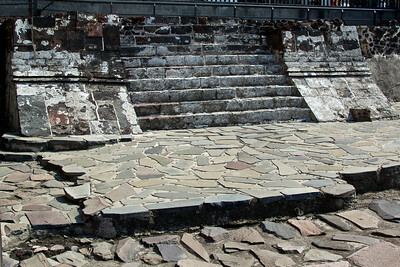 Good view of the stone used to build the temples. Looks volcanic, with a reddish hue. 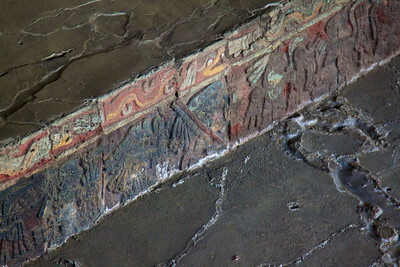 At least the last great temple was also covered with stucco and painted. 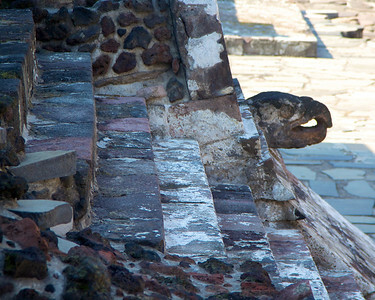 Another serpent head. 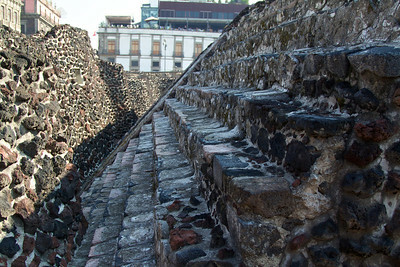 This also shows the slope of the pyramid. 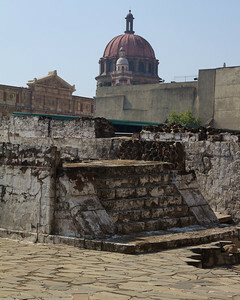 It's hard to appreciate, but the wall in the foreground is from one building of the temple while that in the background is from a later building around the prior temple. 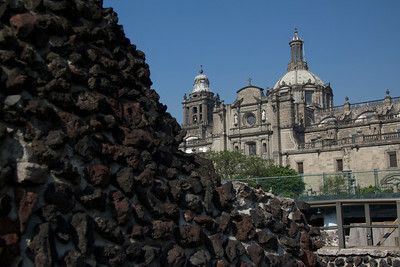 Metropolitan Cathedral in background. 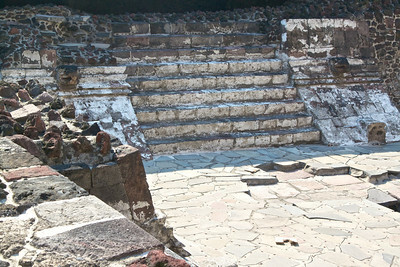 Here you can see the old staircase of an older temple surrounded by the walls of a newer temple. 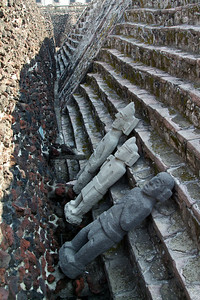 Close up of statues found leaning against staircase. 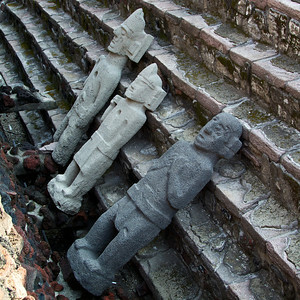 Sculptures (replicas here) found leaning against stairway of Great Temple. 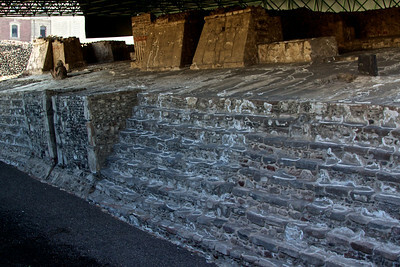 This is an enlargement built in 1431 during the reign of Itzcoatl when the Mexicas started gaining power through building alliances and through warfare. 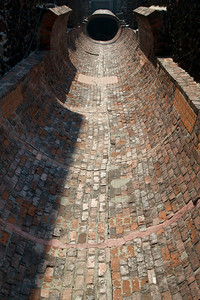 Brick water channel built around 1900. 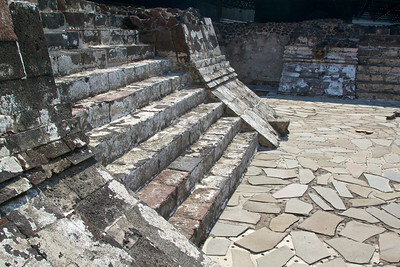 Construction cut through Great Temple destroying the building phases throughout 6 feet width. 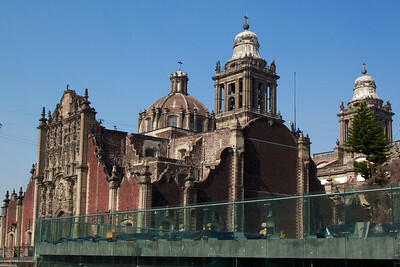 Likely that the Great Temple was buried beneath Metropolitan Cathedral and surrounding buildings, this area wasn't excavated until after 1978. 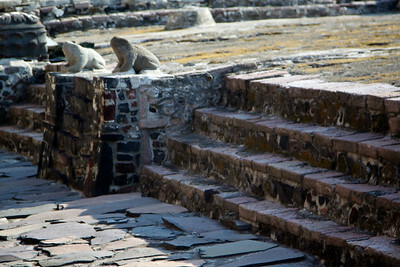 One of the 2 shrines of the Great Temple. 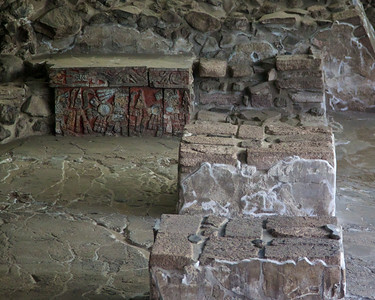 The black stone barely visible on the right is where human sacrifices were carried out. 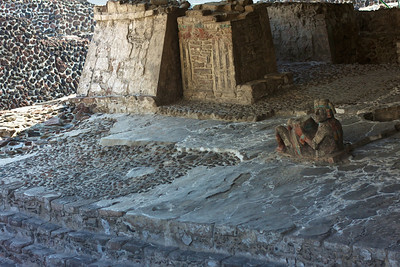 One of the 2 shrines of the Great Temple. 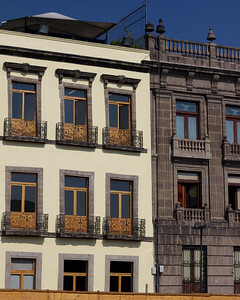 This one dedicated to Huitzilopochtli, god of warfare and patron deity of Mexicas. 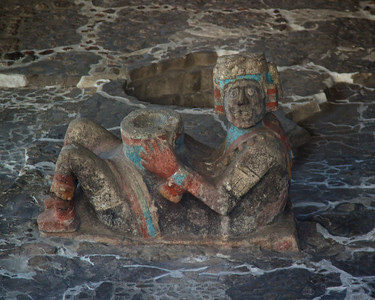 Cremated remains of Mexica leaders were deposited in funerary urns beneath the floor. 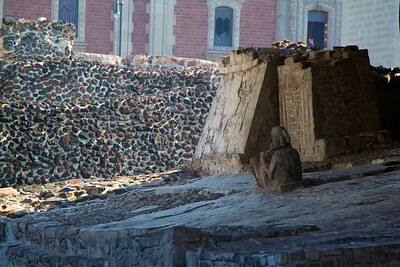 More of the shrine at the Great Temple. 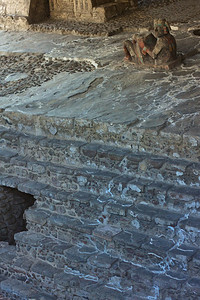 Shrine at the Great Temple. 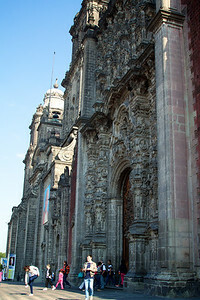 When built, these would have been very tall and decorated at the top with architectural details. 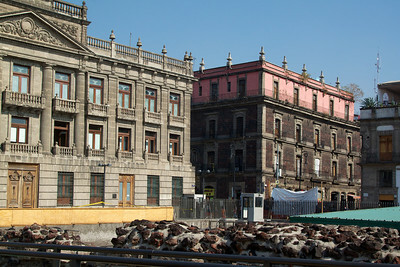 Buildings surrounding the Templo Mayor site. 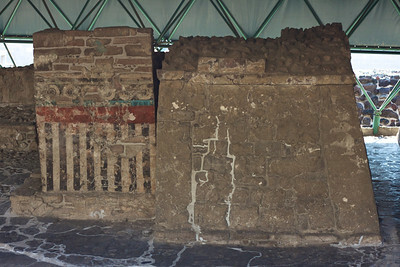 Another picture of the shrine at the Great Temple. 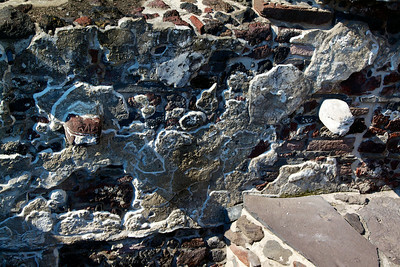 You can see remains of the original paint, these were covered with stucco and painted. 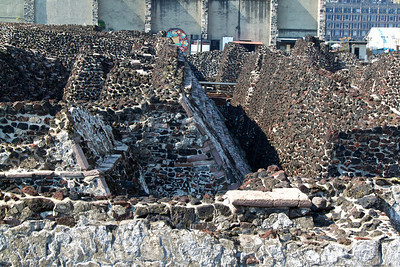 View of the multiple layers of walls from each rebuilding of the Great Temple. 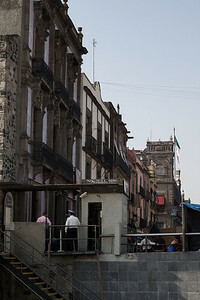 More views of surrounding buildings. 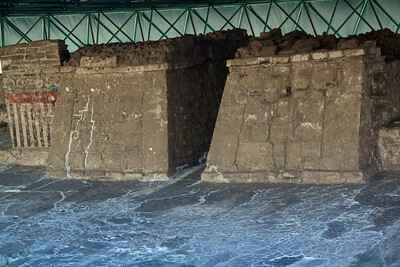 View of the multiple walls from each successive enlargement of the Great Temple. 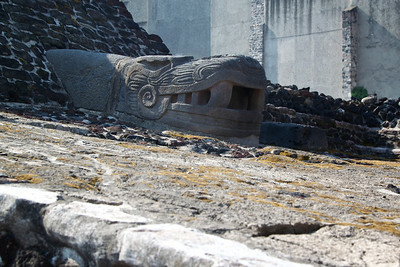 Serpent heads projecting from wall. 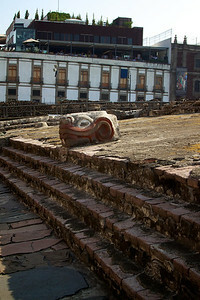 Another view of the serpents and frogs. 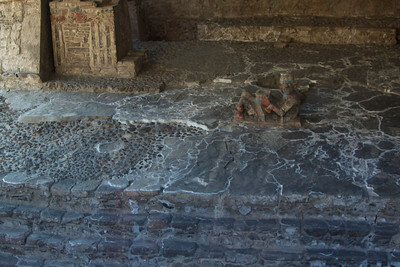 Bench in House of the Eagles.